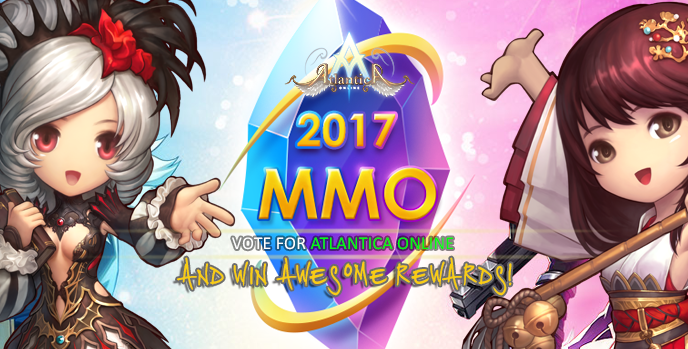 [EVENT] Atlantica Online Voting - MMOSite! The 2017 MMOsite Readers' Choice Awards Event is a worldwide event that involves the entire online gaming population. Please remember to vote once every 24 hours and for each category! There are numerous categories being contested. Atlantica Online falls in these 3 categories: Favorite MMORPG, Most Classic, Best Innovation. The event is divided into 2 rounds. The first round is held on Dec.1st-Dec.20th, and the next will be held on Dec.21st- Jan.4th. And of course, we would not let you guys go empty handed after supporting Atlantica Online! Prizes will be given on to all players once we have won a spot on any of the categories! However, winning more categories means better prizes! Here are the rewards for this event! Our fate lies in your hands, fated Atlantian! Let's dominate the competition!